The Arosa Ski Resort in Arosa, Switzerland located in the Canton of Graubünden, offers skiers the possibility of 70 km (44 miles) of downhill skiing, which for the Adventure Kids, proved irresistible, as we tackled the pristine ski slopes. Switzerland and skiing go hand in hand, so when we took a winter vacation at the end of January 2008 to Arosa, we knew that we had to go skiing. (Debra) grew up skiing, yet for (Edward) this would be his skiing debut. After years of hearing about (my) former skiing escapades, he was finally ready to try to learn this alpine sport, as the weather was perfect, and the slopes were in optimum condition. Since we would only be skiing for a few days during our trip, we opted to rent our ski equipment rather than check it on the plane, and then carry it on the train enroute to Arosa. On a bright, sunny morning, our driver from the Tschuggen Grand Hotel drove us to Carmenna Sport where Barbie one of the technicians at the shop, outfitted us with skis, poles, and boots. Although we get along very well, we decided that for the sake of our sanity, as well as in the best interest of all parties involved, that (Edward) should have someone other than (Debra) teach him how to ski. By the time (Edward's) Ski Instructor, Kurli Zippert-Elderkin of the Schweizer Ski- und Snowboardschule (Swiss Ski and Snowboard School), arrived at Carmenna Sport to pick us up, we were fully equipped and looked every bit like skiers, and anxious to hit the slopes. Infinitely patient, a married father with three small children, and a ski instructor for over 19 years, Kurli was definitely the right instructor for this task of teaching Edward to ski. As we rode the cable car up the mountain, he explained a little about the Arosa Ski Resort, which has a total of 16 ski lifts servicing the 55 pistes (runs) comprised of 21 blue (beginner) pistes, 31 red (intermediate) pistes, and 3 black (expert) pistes. As a novice, naturally, Edward's lessons would be taking place on the blue pistes. 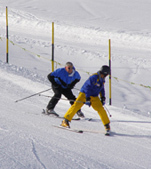 Debra: My father taught me to ski as a child, and I grew up skiing, however, due to our travel schedule, I had not skied for several years, so I was eagerly looking forward to renewing my old passion for skiing. 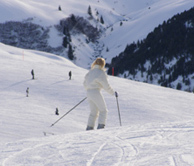 As Kurli explained to Edward how to put on his skis, I stepped onto my skis and smiled when I heard the familiar "click" sound of my boots making the connection with the bindings on the skis, and I was ready to experience skiing in Switzerland. As I waited for Edward to get organized, I looked around at the majestic mountains, and felt a flutter in my heart at the opportunity to ski again, especially in such a spectacular setting. Like a proud parent, I watched as Edward diligently followed Kurli's instructions on how to snowplow, and felt like shouting with glee when I actually saw him skiing! Of course, his progress was short lived, as he promptly fell after going a few feet, but no matter, he had skied, and was back up on his feet with a smile on his face, and eager to try again. I was so happy that I was finally able to share my passion for skiing with him. Edward: I have always been thrilled by the power, speed, finesse, and beauty of skiing, so when the opportunity presented itself, I was ready. I am someone that perseveres through a challenge, and I knew that the pristine slopes of Arosa were going to test me. Listening intently as Kurli talked me through the first baby steps of skiing, I was focused. How could I be anything but focused, this was Switzerland, the land of skiing, I had to succeed and I did. Following Kurli's lead I snowplowed my way through the first few mini-slopes as we moved on to turning and of course how to use my poles to recover from a fall. Debra: At this point, knowing that Edward was in Kurli's capable hands, I skied on ahead and photographed Edward as he steadily made progress down the slope. As for me, it felt fabulous to be back on skis again, and hear the sound of my skis gliding through the powder and feel the wind blowing through my hair. Edward: Next, Kurli had me try a few more challenging slopes and I followed his lead as we worked our way down while snowplowing and stepping our way along. I did some creative maneuvers including a 360° turn and stayed on my skis, skiing backwards and trying to figure out how to turn around quickly, and falling a few times, but always bouncing right back up to follow the instructor. Moving from slope to slope, I worked on doing a series of wide traverses, stopping and starting, as well as using the snowplow while distributing my weight to the opposite side to make a turn. I was having fun and progressing at a pretty rapid rate, or so my instructor told me. The morning lesson flew by, and after a good workout it was time to break for lunch and take some time to discuss what was working, what I had to work on, and stop to actually take in the magnificent beauty that is Arosa. Eating our lunch outside and basking in the sunshine, we enjoyed watching the activity taking place around us on the slopes and even in the air, as yellow hot air balloons carrying passengers cruised by, and brightly colored paragliders drifted along. In addition to the skiers and snowboarders that come to the Arosa Ski Resort, the area is also very popular for trekking as we witnessed what seemed like a small parade of people out for a stroll on the mountain with their dogs, as well as families taking their children sledding, who all wanted to enjoy the singularly beautiful blue sky day. After lunch, we thanked Kurli for the lesson, and then set off to practice (Edward's) new skiing skills. However, learning to ski is hard work, and after a few runs, we decided that he (Edward) would relax and do some photography while I (Debra) would go off on my own and work the slopes at my own pace. Flying down the blue piste, as I was still getting my "ski legs" back, I felt my spirit soar as I schussed the slopes gaining speed until I reached the lift, where I started all over again. However, after making a few runs, my legs started to feel the workout, and knowing when to stop, I reluctantly met Edward and decided to call it a day in regards to skiing, whereupon we took the cable car to the top of Weisshorn. The view from the cable car of the mountains, skiers, and snowboarders on the slopes below us was impressive, as we made our way to the summit of Weisshorn with an elevation of 2,653 meters (8,704 feet) where it is possible to see 400 peaks. We stepped out of the cable car and walked up the steps to the exit, and could not believe our eyes when we looked out and saw palm trees in the snow and lounge chairs at the outdoor bar. 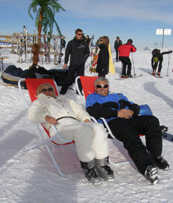 Okay, upon closer inspection we discovered that they were artificial palm trees, but that did little to deter the spirit of our skiing compatriots who lounged on the chairs with drinks in their hands listening to the music and soaking up the rays of the sun. Deciding that we too, had earned a little break, we bought two drinks and settled comfortably into our lounge chairs and enjoyed the view from the top. Skiing at the Arosa Ski Resort was truly a magical day, and certainly one that we will recall fondly with a twinkle in our eye and a smile on our face, as we tackle our next adventure. Read other articles on Arosa in the Destinations, Hotels and Resorts, Restaurants, Chefs' Recipes, Spas, and Adventures sections. For information on Switzerland, please visit the website: www.MySwitzerland.com. For information on Arosa, please visit the website: www.Arosa.ch. 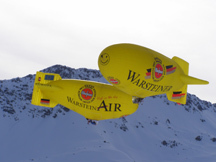 For information on St. Moritz, please visit the websites: www.StMoritz.ch and www.Engadine.StMoritz.ch. For information on the St. Moritz Gourmet Festival and all of its events, please visit the website: www.StMoritz-GourmetFestival.ch. For information on the Cartier World Cup Polo on Snow, please visit the website: www.PoloStMoritz.com. For information on Swiss International Air Lines, please visit the website: www.swiss.com. 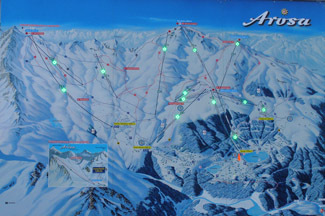 For information on the Swiss Pass, please visit the website: www.SwissTravelSystem.com. For information on Lucerne, please visit the website: www.Luzern.org. 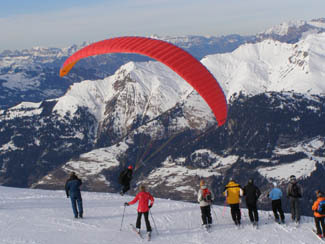 For information on Interlaken, please visit the website: www.InterlakenTourism.ch. For information on Bern, please visit the website: www.Berninfo.com. For information on Zurich, please visit the website: www.Zuerich.com. © March 2008. Luxury Experience. www.LuxuryExperience.com All rights reserved.